From the motorways in the region you do occasionally catch glances of the mining works in this area, but you only see the true extent when you take to the back roads. 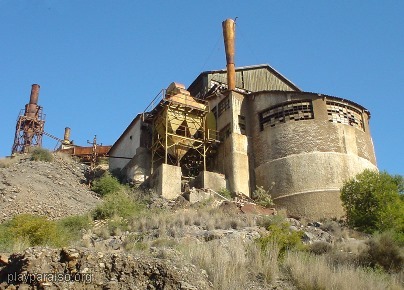 The region has been mined for minerals since Roman times and derelict workings litter the area. The back road from La Manga Club to Cartagena will take you past kilometers of this landscape. In the middle of all this is the town (or village ?) of Portman which is currently having a lot of effort and money put into regeneration. It is self contained and has a mixture of new low rise developments and more traditional older properties. The beach consists of dark sand and at present is a bit of a wasteland, but this is being improved; a new promenade is being built and the whole area is being given a general tidy up. In the near future (or so we are told) Portman is going to be a very desirable address. If you want to take a really rough (but scenic) road through this area, follow the signs from Portman to Lllano del Beal. 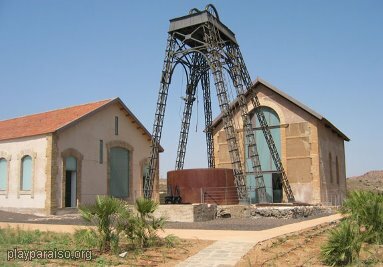 I am interested in finding out more about exactly what was mined in the area and when, but have been unable to find much information on the subject. However, on the way out of Cartagena (going towards Playa Paraiso) there is a signpost that points towards a mining museum, but details about it seem to be scant and opening hours are very limited.